If The Dance of Reality is the director’s final film, it will make for a satisfying yet minor work. It’s hard to believe Alejandro Jodorowsky hasn’t released a film in almost 25 years. The cult director, whose surreal hit El Topo made him the father of midnight movies, is only increasing in popularity over the years. Now, with The Dance of Reality and Frank Pavich’s documentary Jodorowsky’s Dune, 2014 is the year where the 85-year-old director’s filmmaking career comes back to life. The Dance of Reality feels like the director never left the director’s chair in his two-plus decade absence though; he’s as strong as he ever was, and his latest work shows no drop in quality or imagination. 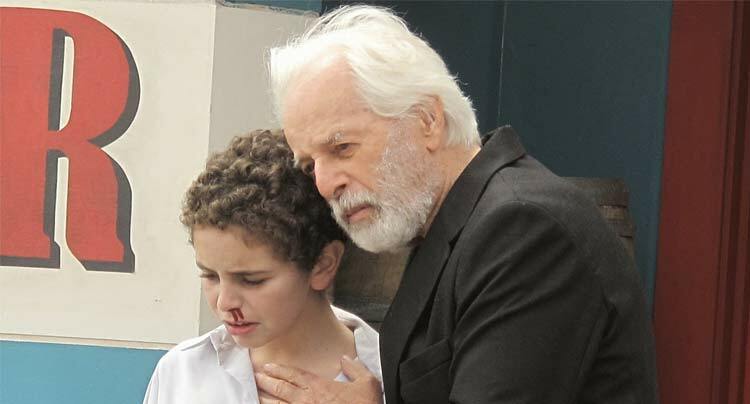 The film is autobiographical, or as autobiographical as Jodorowsky can be. It starts with a young Alejandro (Jeremías Herskovits) growing up in Tocopilla, Chile. His father Jaime (Brontis Jodorowsky) is a tough Communist, while his mother (Pamela Flores, singing every one of her lines in an operatic fashion) provides love and affection he can’t receive from his father’s overtly masculine attitude. Jaime abuses his son repeatedly, forcing him to get beaten up or have dental surgery without anaesthetic to earn his “approval.” Alejandro’s mother disowns him once his long, curly blond hair is cut off by Jaime. Jodorowsky’s childhood is one defined by exclusion and isolation, not only by his parents but also by his Ukrainian and Jewish background. The melancholy undercurrent runs throughout the film, only offset by the surreal and sometimes humourous images Jodorowsky conjures up. Themes and ideas from the filmmaker’s other works often pop up: religion, spirituality, deformities, even Jodorowsky himself just to name a few. These scenes, combined with the overly colourful set design and compositions, are just as fascinating and bizarre as anything in The Holy Mountain or Santa Sangre. As a filmmaker, Jodorowsky works in paradoxes. His films constantly call attention to the filmmaking process (seen here by the director inserting himself into scenes as he narrates) yet their spell is never broken; his films are dark and vulgar, but they’re infused with a childlike sense of wonder to them. When The Dance of Reality keeps its focus on Alejandro’s upbringing in Tocopilla, the film functions as a brilliantly crass fairy tale of sorts. Simply put, Jodorowsky is a truly singular filmmaker, and it’s impossible to think of any other director in the past or future capable of matching his level of creativity. Eventually the autobiographical elements get pushed off to the background, the perspective shifting from a young Jodorowsky to his father’s own journey back home after a botched attempt to assassinate the country’s president. This storyline isn’t as affective as Jodorowsky’s own childhood experiences, with a lot of repetitive moments contributing to the film’s bloated two-plus hour runtime. The Dance of Reality may suffer from some indulgences, but one can’t really blame Jodorowsky for indulging after such a long absence. If The Dance of Reality is the director’s final film, it will make for a satisfying yet minor work, and a fitting culmination of his career. Of course one can’t predict or expect what Jodorowsky will do next, but getting anything new from a person this creative feels like a gift by this point.